Today was kind of a bad day. One of those days where nothing big goes wrong but every possible little thing does. To distract myself, I went to my friend Elizabeth’s blog and saw her latest cooking experiment–Margarita Cookies! The recipe came from Smitten Kitchen, a blog that’s new to me (there are so many out there to conquer on so many different topics). So I went straight to Smitten Kitchen in search of something to cheer myself up with tonight, and there it was on the front page: S’Mores Pie! It looked incredible, so I worked on it as soon as I got home. I cannot tell you how giddy I was to make marshmallow from scratch. I haven’t made a pie since I was a kid, but after a Christmas obsession with the movie Waitress I kept thinking I should become a pie person. This was my chance. It was pretty easy but required a lot of cooling time at various stages, so we didn’t actually eat it until after 10pm. While it didn’t have the same eyes-widening impact on Adam as the Triple Chocolate Peppermint Trifle or Grant’s Brownies (both of which I’m sure I will write about someday), it was pretty good. I made it with bittersweet chocolate, so it was a bit rich as Adam’s family would say. Next time maybe I would try milk chocolate. I also was a bit overzealous with my broiling of the top, which tasted like camp to me but tasted like burned marshmallows to Adam. Very different associations, Brits don’t really get s’mores. Come to think of it, this pie is another example of nothing big going wrong today but lots of little things not going as planned. Really, the best part about this was playing with the marshmallow while I was making it. I should give it a Waitress-y pie name like Burn Today in Effigy Pie or something. I did, however, learn the basics of making candy. Maybe instead of being a pie person I’ll become a candy person. Put oven rack in middle position and preheat oven to 350°F. Lightly butter pie 9- to 9 1/2-inch pie plate. Stir together all ingredients in a bowl and press evenly on bottom and up side of pie plate. Bake until crisp, 12 to 15 minutes, then cool on a rack to room temperature, about 45 minutes. Put oven rack in middle position and preheat oven to 350°F. Put chocolate in a large bowl. Bring cream just to a boil in a 1- to 1 1/2-quart heavy saucepan, then pour hot cream over chocolate. Let stand 1 minute, then gently whisk until chocolate is melted and mixture is smooth. Gently whisk in egg and a pinch of salt until combined and pour into graham cracker crumb crust (crust will be about half full). Cover edge of pie with a pie shield or foil and bake until filling is softly set and trembles slightly in center when gently shaken, about 25 minutes. Cool pie to room temperature on a rack (filling will firm as it cools), about 1 hour. Sprinkle gelatin over 1/4 cup cold water in a large deep heatproof bowl and let stand until softened, about 1 minute. Stir together sugar, corn syrup, a pinch of salt, and remaining 1/4 cup water in cleaned 1- to 1 1/4-quart heavy saucepan. Bring to a boil over moderate heat, stirring until sugar is dissolved, then boil until thermometer registers 260°F, about 6 minutes. Begin beating water and gelatin mixture with an electric mixer at medium speed, then carefully pour in hot syrup in a slow stream, beating (avoid beaters and side of bowl). When all of syrup is added, increase speed to high and continue beating until mixture is tripled in volume and very thick, about 5 minutes. Add vanilla and beat until combined, then immediately spoon topping onto center of pie filling; it will slowly spread to cover top of pie. Chill, uncovered, 1 hour, then cover loosely with lightly oiled plastic wrap (oiled side down) and chill 3 hours more. Transfer pie to a baking sheet. 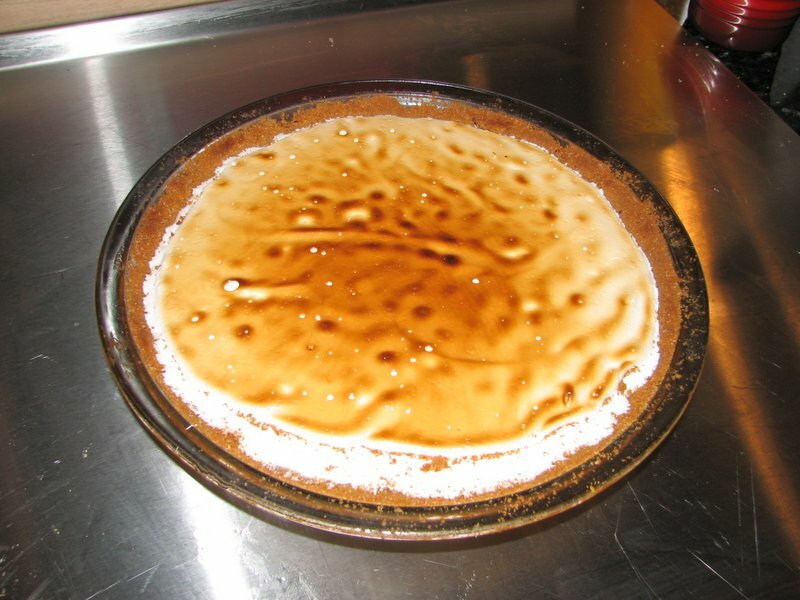 Cover edge of pie with pie shield or foil and broil 3 to 4 inches from heat, rotating pie as necessary, until marshmallow topping is golden brown, about 3 minutes. Cool pie on a rack 10 minutes. Slice pie with a large heavy knife dipped in hot water and then dried with a towel before cutting each slice. Note: Pie (before browning topping) can be chilled up to 1 day.